Image Description: The background is a navy blue couch with an alternating pattern of dark yellow fleur-de-lis pattern and a maroon red pattern. In the foreground a small squishable pig, it’s lying flat on the surface of the couch-cushion (it doesn’t have any legs), it has small brown sections on its head that resembles ears, it also has random brown splotches across the pig’s body. ~Size: while I wouldn’t consider this particular stim toy a stealth-stim (it’s bright pink for starters), however, it does fit inside the width of my hand, it could be easily carried in a stim toy case/bag/handbag. 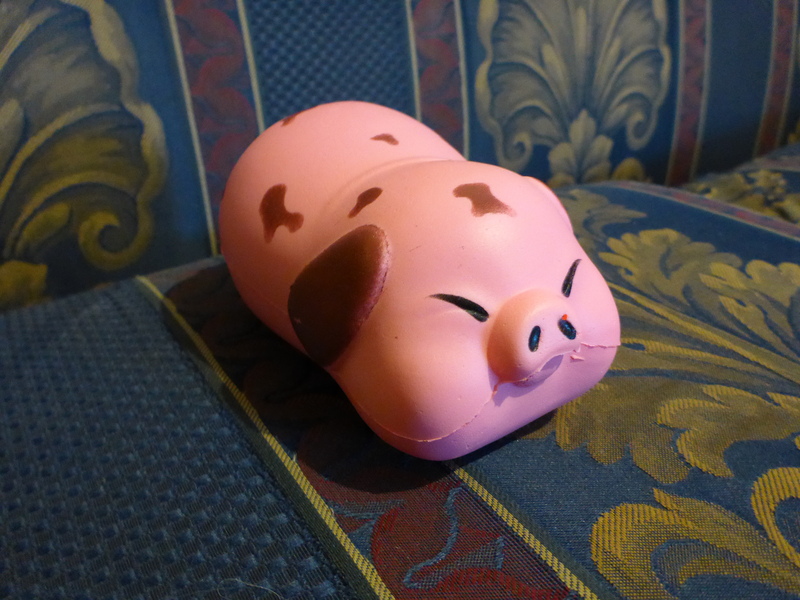 As the pig can rest on a flat surface, this could also be kept at an office desk, if so desired. Image Description: The background is a navy blue couch with an alternating pattern of dark yellow fleur-de-lis pattern and a maroon red pattern. In the foreground is a pale-white hand holding a small squishable pig, it’s lying flat on the palm area (it doesn’t have any legs), it has small brown sections on its head that resemble ears, it also has random brown splotches across the pig’s body. ~Squishability The squishability is pretty good, it’s not slow-rising through, so it bounces back quickly. I’d probably also consider it slightly firmer than my Squishable Strawberry. ~Scent: The item is scented, it’s not a strong smell (your mileage may vary), it’s kind like that sweet bread smell (and maybe coconut? Not sure), however, it’s sweet and kind of irritating for me personally. It’ll fade away if I air it out for a few days, so it’s not a big deal, but I figured others should know. All in all, a cheap squishable item with no shipping fees, so even though the paint is a little off on the face, I’m happy with what I received. 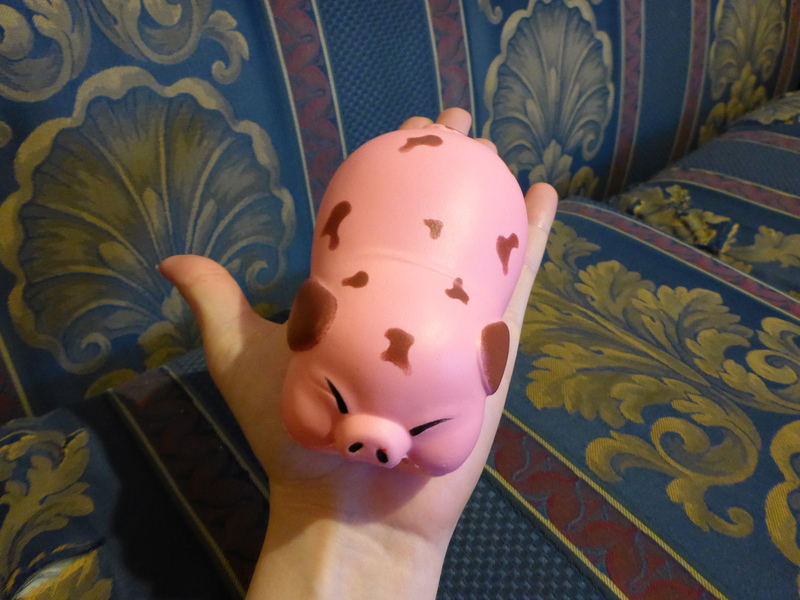 I’ll keep monitoring eBay and Stim Toy Box for more Pig themed items to add to my collection.